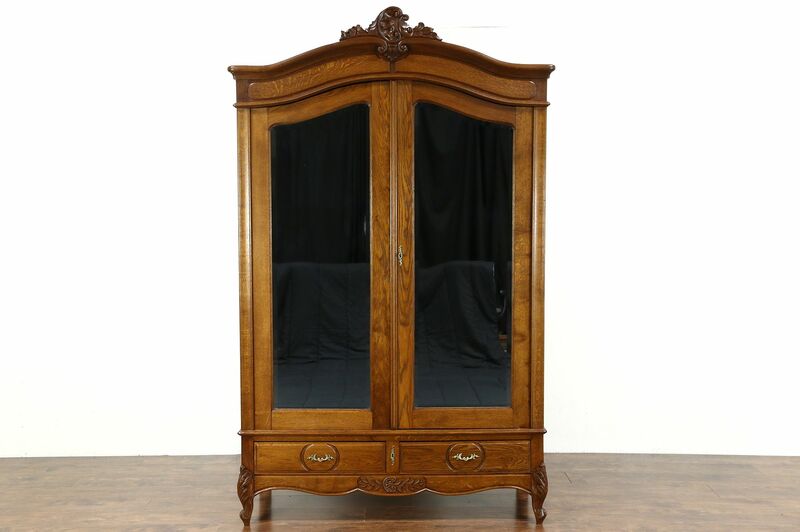 An authentic Country French armoire, wardrobe or closet from about 1915 is solid fine grained oak. Delicate hand carved detailing is beautiful on this antique furniture from France. The restored satiny finish is in excellent condition. A key operates the door lock only, inside is a closet pole. Lower drawers have hand cut dovetail joints. Shaped and beveled door mirrors are in extremely fine condition. Measurements are 57" wide at the crown, 23" deep, 7' 7" tall and interior depth is 20."